The Hawks gave their fans a show last night for the final home game of the 2018-19 season. 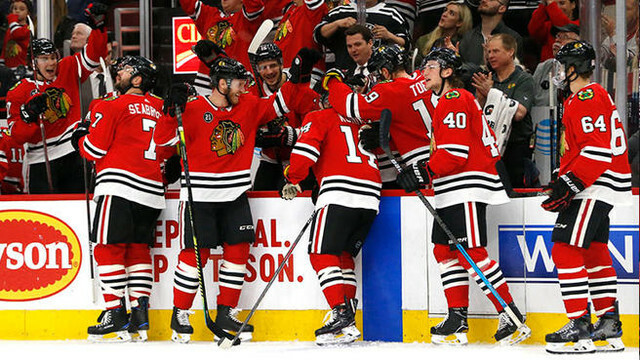 A 6-1 win was exactly what the Chicago fans deserved after such an up-and-down season by their beloved Blackhawks. You could tell the players wanted to get that “W” for them. The Hawks play their last game of the season tonight vs. Nashville. This game means a lot for the Preds as they are fighting for 1st in the Division. A win for them would solidify them as tops of the Central. A loss could have them drop to 3rd if both St. Louis and Winnipeg win. So expect this game to have some bite to it as the Hawks would love to do nothing more than to spoil the Preds fun. * I was surprised that Marcus Kruger was not dressed in last night’s game. While the team hasn’t said anything, the speculation by most is that Kruger will not be back next year. Therefore that would have been his last game in Chicago – a place where he won 2x Stanley Cups. With Colliton being so good with recognizing key moments like this, it leads me to think… hmmm… maybe Kruger will be back next year? * Corey Crawford left the game last night a groin injury. He will not be in Nashville tonight. A tough way to end the season, but I’m sure Corey is ready for it to be over and I will be analyzing in length what the future holds for #50. * In related news, Chicago recalled Kevin Lankinen on an emergency basis. He was the man to get the call as Delia and Forsberg are needed in Texas as they still push for the playoffs. * Who else will be possibly playing their last game for Chicago? Cam Ward who will be getting the start tonight, unless Lankinen gets a surprise start. Depending on what’s decided in the offseason, Cam Ward could be resigned if management doesn’t think Crawford can hold up for an entire season. This will be an interesting area to keep an eye on throughout the summer. * Back to Rockford, a real tough loss last night vs. the Stars. They fell 2-1 with the winning goal on a penalty shot by Ty Dellandrea. The ‘Hogs sit 7th in the division with 4 games to go, so their playoff hopes are fading. They need 5 points to catch the 4th place Admirals (a team they lost 3 consecutive games too just weeks ago). They play Texas again tonight as they look for revenge. * Dennis Gilbert had a shaky start to his first ever NHL game, but I thought as the game went along he looked solid. He will be a guy who will be a leader in Rockford next year and might possibly see spot duty in Chicago if he continues to develop. * Phillip Kurashev made his AHL debut last night. He played on a wing with Nilsson and Luke Johnson. He looked like a guy who was getting used to a new league. He’s a quick study though, so interesting to see his play in these last 4 games. I’m a big fan of his overall game. * Adam Boqvist and Mackenzie Entwhistle started their series in the 2nd round of the OHL playoffs and it was Boqvist’s Knights that got the best of the Storm. Both players looked like they played well with Entwhistle netting a goal. Enjoy the last game tonight!